Visiting Nova Scotia this summer and want to try camping but don’t have the gear? East Coast Glamping can kit you out with all the ‘top quality’ gear you’ll need for a weekend by sea or in the woods with our Wanderlust Gear Rental DIY Camping Kits! Choose from a selection of Nova Scotia Day Trips and we’ll show you how to turn them into a 4-7 day Glamping adventure! Here’s a great day-tripping map. Take along an ECG DIY Go Glamping Kit and make it week long adventure around Nova Scotia! East Coast Glamping’s Wanderlust Gear Rental Kit is compact, amazing value and packed full of ‘top quality’ gear for a great camping adventure! Airport delivery available or pick-up and return at our Hammonds Plains location. We’re located only 20 mins. from Halifax and 20 mins. from Halifax Stanfield International Airport. Ocean camping, nature walks, swimming pool all at The Ovens Natural Park. Head South Shore way along the scenic Lighthouse Route and Go Glamping for 2 nights at The Ovens Natural Park campground on a 190 acre coastal forest. Or check out one Provincial Parks Campground or Keji National Park! Experience the roar of Cannon Cave at The Ovens Natural Park. Taste local! If you’re travelling closer to Fall, visit the Terra Beata U-Pick Cranberry Farm. Eat lobster! Fresh steamed lobster purchased from a local lobster pound. Try Reyers Lobster Pound near Peggys Cove or Halls Harbour in the Valley. 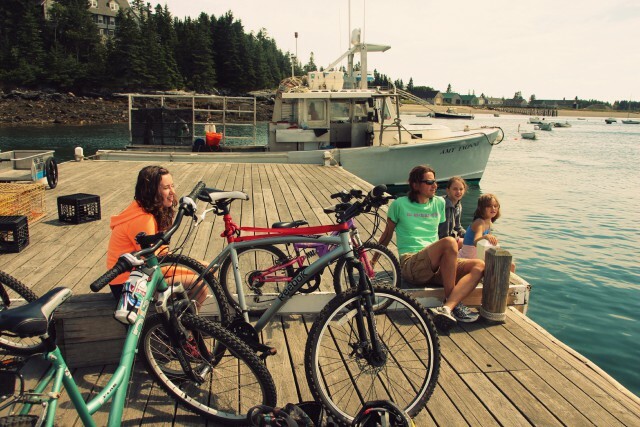 Or stay in the coastal town of Lunenburg at the Lunenburg Board of Trade campground, a hilltop campground with views of Black Harbour. From here you can village hop to Mahone Bay or head to Chester. In Chester, pick-up a picnic lunch and take the ferry to Big Tancook Island for a fabulous day ‘stepping back in time’. 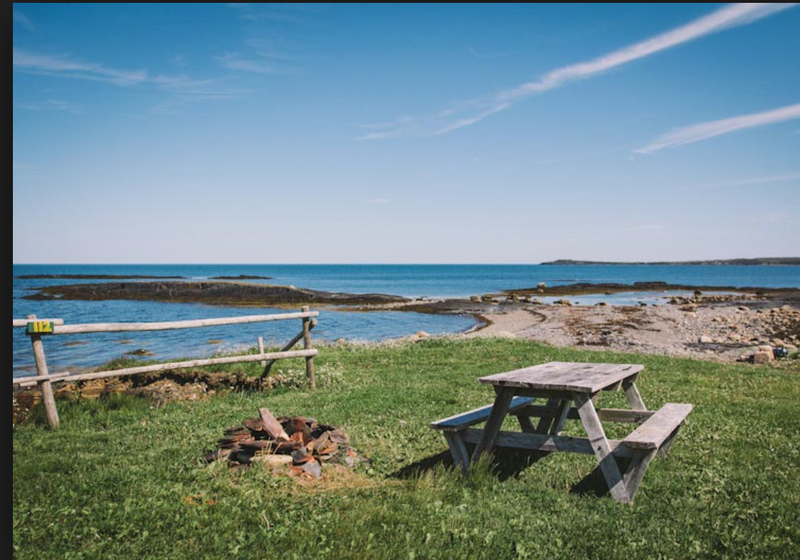 This day-trip reminds us of visiting the Cranberry Islands off Mount Desert Island in Maine, where all you needs your walking shoes or your bicycles, a picnic and the will to ‘Get lost – Find beautiful’! Bring the bikes: The ferry from Chester takes foot passengers and bicycles. If you’re not travelling with bikes, we can have them supplied to your campground! Love cycling, here’s some of our other favourite cycling routes! If it’s Peggy’s Cove and her iconic lighthouse and lunar-like rocks you long for, Go Glamping at King Neptune Campground, only a short walk to Rhubarb Restaurant. Pick-up a picnic lunch at White Sails Bakery on your way there! And be sure to ask us about snorkelling the picturesque Cranberry Cove, with quiet views to Peggy’s Cove lighthouse. Head for the Valley, stopping at Uniacke Estate Museum Park for a hike in the forest. There are several trails to suit your stamina. 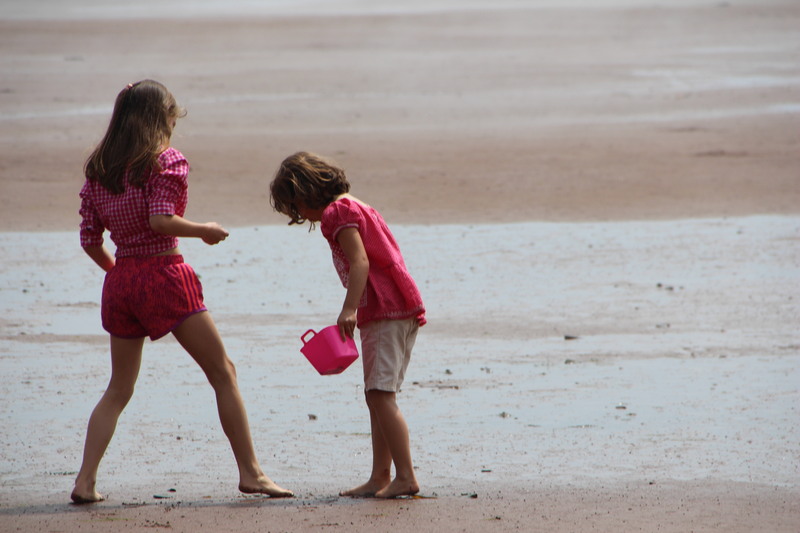 Go Glamping at The Look Off Family Campground or Blomidon Provincial Park or check out Smileys Provincial Park, a short day trip to Burnt Coat Head, home of the world’s highest tides. Take along a picnic lunch from The Flying Apron Cookery. At The Lookoff Family Campground partake in some of our fave Valley Glamping Adventures! Enjoy breathtaking views, hikes, walk the ocean floor at Blomidon Provincial Park or Kingsport. Enroute, taste local at a local vineyard, Farmers’ Market (click for a map to the Nova Scotia Farmers’ Market and inspiration!) or enjoy an hour at The Tangled Garden, sampling homemade ice-cream and jellies and exploring the labyrinth. 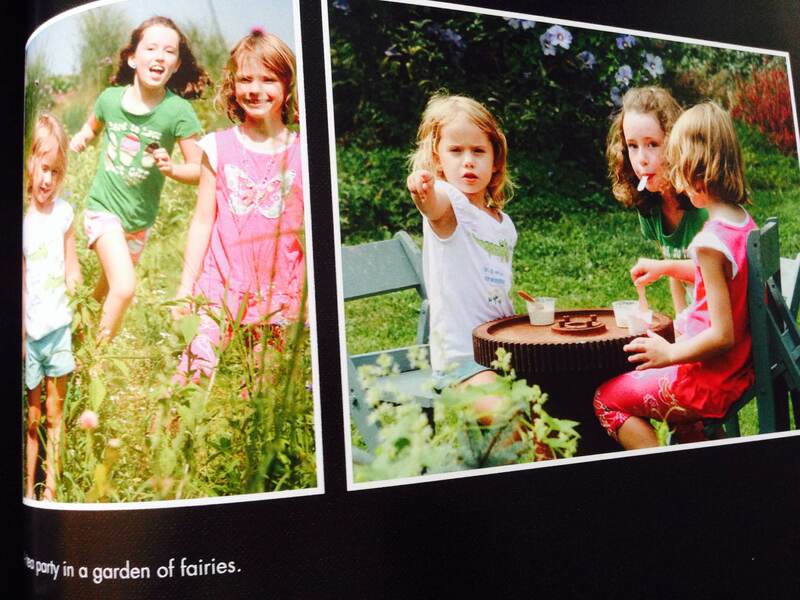 Eating lavender ice-cream with the fairies and running the labyrinth at Tangled Garden in Grand Pre. Journey towards Nova Scotia’s warmest beaches, like Blue Sea Beach, and coastline speckled with coastal farms, trails and sea kayaking. Pitch at Caribou Provincial Park or one of the many campgrounds in the area. 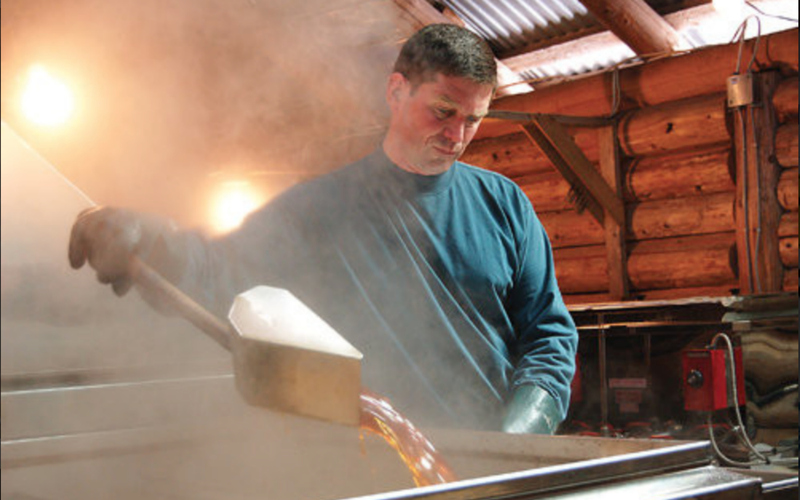 Taste the maple at Sugar Moon Farm and walk some of their lovely forested trails. Afterwards, enjoy a bite in their cosy restaurant. From here visit Sugar Moon Maple Farm and Seafoam Lavender Farm, enjoy an afternoon at a warm beach. Discounts available with ECG Glamping packages. Here’s a few of our faves, including sea kayaking and zip lining! Stop by Tatamagouche and go cycling along some of the TransCanada Trail. Or head for Cape Breton Highlands for some Highland Glamping! Vistas, hikes; Cape Breton Highlands National Park has it all. Spend a picturesque night in a ready-pitched bell tent at Kluskap Ridge Campground, furnished by East Coast Glamping for 2 to 4 people. This platformed site is situated in a wooded campsite over-looking beautiful St. Ann’s Bay near Englishtown. The campground offers a unique cultural experience to it’s guests, along with may ‘bonus’ amenities like an in-ground swimming pool, games room and indoor lounge with fireplace, crafting activities and yoga. Make sure you find time to get out travelling – it’s a difficult place to leave! Running the quiet beach at McLeod’s in September. This is only the tip-of-the-iceberg for exploring in Nova Scotia. Consider heading down to Yarmouth and Digby area for whale watching and Acadian Charm. Add any of these options and make it a week filled of getting lost … and finding beautiful with East Coast Glamping. Our Wanderlust Gear Rental Packages for 2 people starts from only $120 per night for two people. Click here for details about Highland Glamping. *Wanderlust Gear Rental DIY Packs streamlined to fit full-size and large rental vehicles based on two people.